The best movies app for the iPad just got another great update yesterday. Fandango Movies has a new icon, a very cool new Spotlight carousel feature, and a few more nice improvements. • The Spotlight carousel now available for both iPhone and iPad! 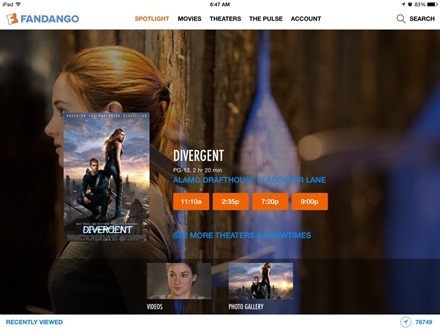 • Sign in to your Fandango account using Facebook or Google+ (iPhone only; iPad coming soon). Don’t have an account yet? Create one now for one-tap purchases and to save your favorite theaters. Fandango has been an excellent iPad app as long as I can remember. It makes it quick and easy to find a great movie, check out when it’s showing in nearby theaters, choose seats and book tickets right within the app. This is a very nice update to this already stellar app. Here’s an App Store link for Fandango Movies; it’s a free app and a universal app designed to run on both iPad and iPhone.